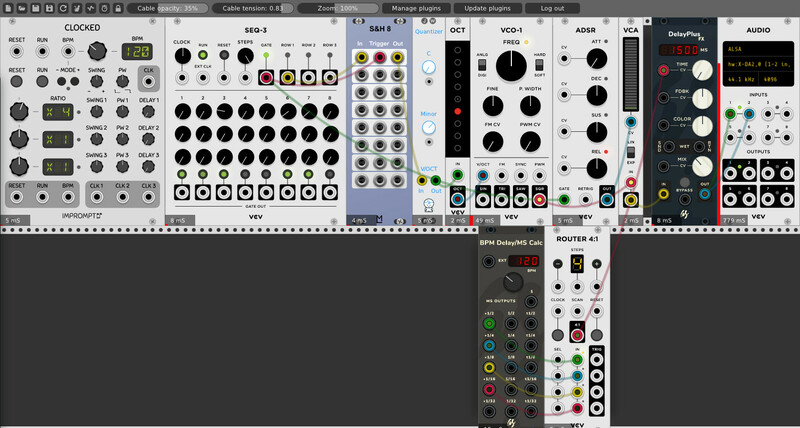 VCVRackTutorial: Using modulated delay times in VCV Rack – Do My Eyes Look Scary? This is a method of patching and modulating delays I find so compelling I felt moved to write about it. 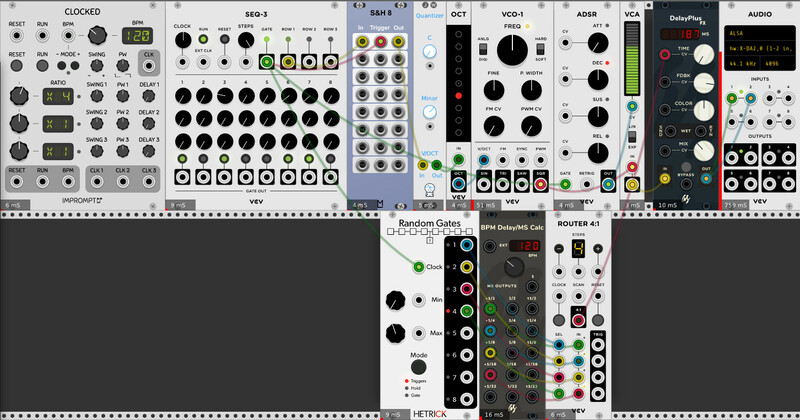 This is all done in the software modular system VCVRack, and assumes you have a basic working knowledge of it. 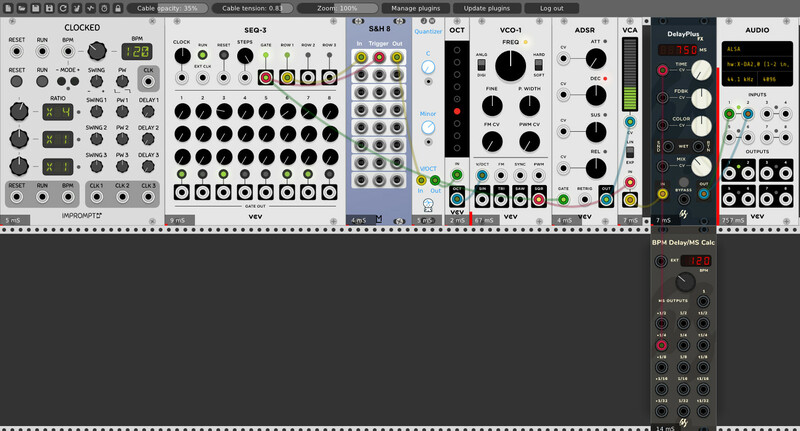 It involves the VCV Router plugin, which is non-free plugin from the makers of VCV Rack, but I consider it a mandatory purchase. This is a single voice sequenced by a Fundamental SEQ-3 Module. 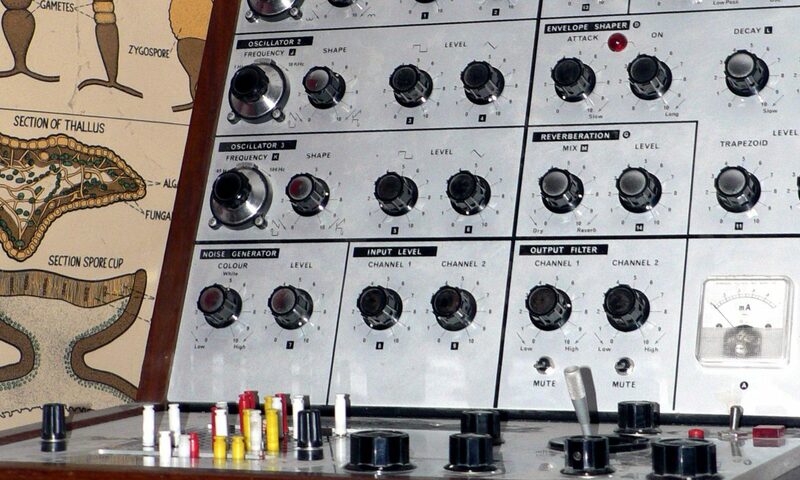 Clock triggers sequencer, clock sends pitch to oscillator and gate to envelope. Envelope modules volume of oscillator signal via a Fundamental VCA-1. The only remotely complicated part is in the middle where the pitch signal is captured in a Sample & Hold, triggered by the gate from SEQ-3. It’s then quantized by a JW Quantizer and transposed by a Fundamental Octave module. This sounds fun, and you can play with delay time and feedback. As it happens this delay module models actual analog delays to the extent that changing the delay time affects the pitch of the delays. If you load this patch you can hear this by turning the delay time knob. Now the delays fall in the rhythmic grid, in this case, a dotted quarter note after the dry signal from the VCA. The fun begins when you modulate the delay time. In this case I use 4 different outputs from the BPM Delay/MS Calc, for dotted half notes, dotted quarter notes, dotted 8th notes, and dotted 16th notes. You can select different delay times by clicking on the ‘Clock’ button on the Fundamental Router 4:1. Now comes the fun part. I add a Hetrick Random Gates module, and send it the gate output of the SEQ-3 to trigger it. I also turn down the Max knob on the Random Gates so that only gates 1/4 are triggered. I then feed the first 4 trigger outputs on the Random Gates into the ‘Sel’ inputs on the Router 4:1. What is the result? Every time a new note is triggered by SEQ-3, a different delay time is randomly selected. What is the result? Something rhythmically and harmonically interesting — it’s continually changes, and each time the delay time changes, it changes the playback speed and pitch of the delayed signal. Now, since we chose 4 differented dotted note delay times, they each have a relationship that is both harmonically and rhythmically coherent. A dotted 16th note is 1/8th as long as a dotted half note, and if you switch between them, the frequency jumps by a factor of whole octaves. In the case of dotted 16th to dotted half note, the transition drops the pitch by 4 octaves. If you haven’t considered the math involved it’s exponential: Twice the time or frequency, increase by one octave, 4 times the time/frequency, increase by two octaves, etc. It gets even more interesting if you don’t choose delay times that are multiples of each others. Say, use dotted 1/2, quarter note, dotted 8th note and 16th note. The dotted half note is 3/2 the time of a 1/4 note, a dotted 8th is 3/2 of a 16th note. Now as it happens, the pitch releationship of 3:2 is a major 5th, so when the delay time changes it also changes the pitch by an interval that is musically interesting! I haven’t worked out all the pitch relationships between different note durations, but listening to the output, it always seems to add up harmonically, no matter which note duration you choose. Here’s an example of the output of this last patch. While recording, I tweaked the sequence a little bit as it played.